(PG-13). If this is, as purported, Jet Li’s last martial-arts epic, he’s going out on a stolid, earnest note as a late 19th century master fighter who learns there’s more to mastery than winning. Director Ronny Yu’s period drama is meat-and-potatoes melodrama, but Li takes it up several notches every time he goes into combat mode. 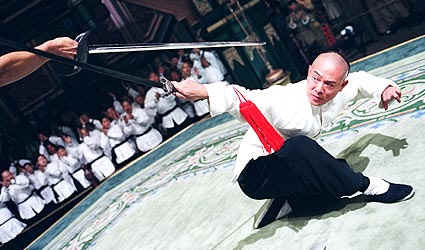 Already a boxoffice hit in Asia, Jet Li’s Fearless, directed by Ronny Yu (helmer of the Hong Kong classic The Bride with White Hair), is Jet Li’s final martial arts masterpiece, capping a tremendous body of work in that genre. Jet Li’s Fearless reunites the actor and martial arts superstar with producer Bill Kong (Hero) and action choreographer Yuen Wo Ping (Unleashed) as he portrays martial arts legend Huo Yuanjia, who became the most famous fighter in all of China at the turn of the 20th Century. Huo faced incredible personal tragedy but ultimately fought his way out of darkness and into history, forever defining the true spirit of martial arts. His self-discovery, and the choices he made, inspired his nation. The son of a great fighter who did not wish for his child to follow in his footsteps, the bullied Huo Yuanjia resolves to teach himself how to fight - and win. Years of training enable him to ace match after match in his home region of Tianjin. But as his fame as a martial arts master grows, so does his pride. After an ill-advised fight leads to another master’s death, members of Huo’s family are slain in revenge. Grieving and ashamed, Huo wanders the country in shock. Near death, he is rescued by women from an idyllic village, and is offered simple kindness and generosity that help him heal and regain his equilibrium over a period of several years. Huo realizes that the future of martial arts lies in sportsmanship and not brutality, and he rejoins society to apply what he has learned. Returning to Tianjin, Huo takes steps to come to terms with his past and restore his family’s name. His evolving, graceful Mizong (Missing) Fist method of fighting brings Huo renewed success, and he forms the progressive Jingwu Sports Federation. Taking note, duplicitous members of the Foreign Chamber of Commerce engineer a Shanghai tournament pitting Huo against four fighters, each representing the major foreign powers in China. Huo commits to the bout and faces off against, respectively, a British boxer, a Spanish swordsman, a Belgian soldier, and a Japanese martial artist. What happened that day in 1910 has never been, and will never be, forgotten in China..